I was raised in a very small conservative community. Swearing was looked down upon, especially if the profanity involved the use of the words “God” or “Jesus.” Although I left that small town fifty years ago, I still cringed at the thought of using cuss words when it came to writing My Darling Dorothy. Dialogue, in order to be believable has to match the character. In My Darling Dorothy, Jack was a young man with a tenth grade education from a small country school. His vocabulary was quite limited because of his lack of education but also because of his environment. No one that he came into contact with on a daily basis had an expansive vocabulary. When armed only with a limited vocabulary and in need of expressing one’s emotions, profanity fills the bill quite nicely, and Jack used it, maybe not extensively, but frequently. The other issue I faced was a desire to be true to the character upon which Jack was based; my father. While it was not acceptable to swear in my hometown, my father swore like a sailor. How could I write believable dialogue about this man and his friends without the use of profanity? The question arose as to whether I should whitewash my father’s personality or let it shine through in all its cussin’ glory. When I imagined deleting all the profanity in the novel, I had a sudden flashback to my father’s funeral. It took place in a church in the little town where he and my mother lived for fifty years. I requested that “Tennessee Waltz” be played as part of the music at the funeral, but my request was denied. Secular music had no place in the church according to the young minister in charge of the service. I gave in without so much as a whimper. The service took place, whitewashed in my estimation and focused more on who my father was not as opposed to who he really was. I have always regretted that decision. Now, fourteen years later, here I was, about to whitewash my father again. This time, however, I refused. I made a commitment to remain true to his character, flaws and all. He may have been crass at times and he was certainly not an eloquent speaker, but he was my father; a man who worked sixteen hour days, six days a week, plus five hours on Sunday, to keep his family fed, clothed and housed. He came home exhausted and yet still found the energy to get down on the floor and play “horsey” with his children. There is honor in that, honor that demands respect. There isn’t an inordinate amount of profanity in My Darling Dorothy, to be sure, and I would encourage all writers to think carefully about how profanity is used in their writing. If every other word is the infamous “F—-” word, perhaps it should be toned down. Perhaps, but it is entirely dependent upon the character and what the character would say and do in any given situation. What matters most is whether you are creating an authentic, believable character and if that includes the use of profanity, so be it. There is a pattern that took shape as I wrote “My Darling Dorothy.” Curiosity about the details mentioned in a letter led to research to learn more about those details. The research led to imagining how those details played out from both Jack’s and Dorothy’s perspectives. The actual words then flowed onto the page (more or less), depending upon how vivid a picture had been painted in my imagination. A perfect example of this process is illustrated in the following sequence of events. This information prompted me to begin to calculate my father’s score. Once I calculated his score, I began imagining Dorothy’s thoughts and concerns about the system and how soon her husband would be able to come home. I also began to wonder how my father handled the stress of not knowing how soon he would make it back to Nebraska. Chapters 54 and 55 of “My Darling Dorothy” are the culmination of this process. “Curiosity, research and imagination”; the perfect triumvirate for writing historical fiction. Today is Memorial Day and I choose to take a moment to remember those who fought in World War II. Of course, my father immediately comes to mind. He fought on the European front, that part of the war with which we are all familiar. But, have you ever heard of the Bataan Death March? It took place on the the Bataan Peninsula in the Philippines in April of 1942 after the Americans surrendered to the Japanese. It is those brave souls who endured that march that I would like to pause and remember today, in particular a young man named Lloyd Greever. The character Tommie in my novel “My Darling Dorothy,” is based on this young man. It was his letters that inspired me to write the novel. 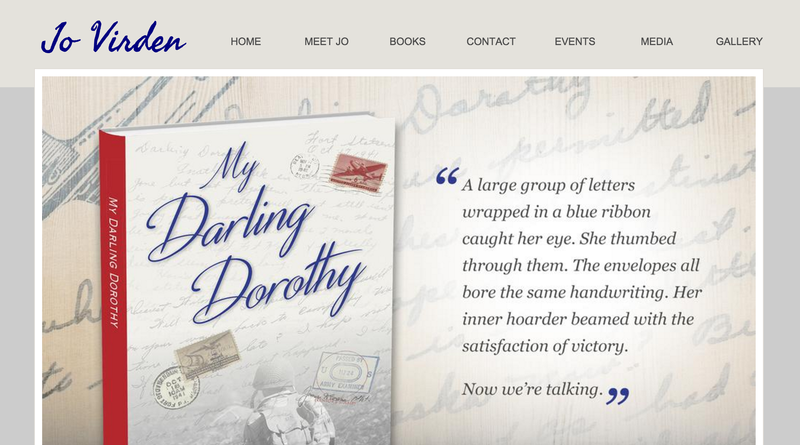 His letters were simple, full of grammatical errors and misspelled words, but they spoke of his hopes and dreams for a future with his “Darling Dorothy.” They exemplify the millions of letters sent home during that war and all wars. I had never heard of the Bataan Death March until I began my research for the novel. I’m a little embarrassed about that. It seems wrong to forget or worse not even to have taken the time to know about the atrocities that war creates. Forgetting or not knowing is what, in my estimation, allows wars to occur over and over again. Perhaps if we all took a moment to learn and remember that war is hell and should be avoided at all costs, the world could evolve into a better place. The attached photo is a picture of American soldiers as they surrendered to the Japanese at the beginning of the march. Thousands of Filipino soldiers and hundred of American soldiers died on the tortuous march before they reached their destination at Camp O’Donnell prison camp. The sixty mile march took place under the stifling heat of the tropical sun with little to no food or water. The POWs were severely abused to the point that the Allied Military Commission judged it to be a Japanese war crime. For more details go to https://en.wikipedia.org/wiki/Bataan_Death_March. I extend my deepest gratitude to all the young men, including my father, Wilmer Smith, and Lloyd Greever, who fought in World War II, and to all the young men and women who have fought in all the wars our country has deemed necessary. I also look forward to a time when gratitude is no longer needed, because war is a thing of the past.